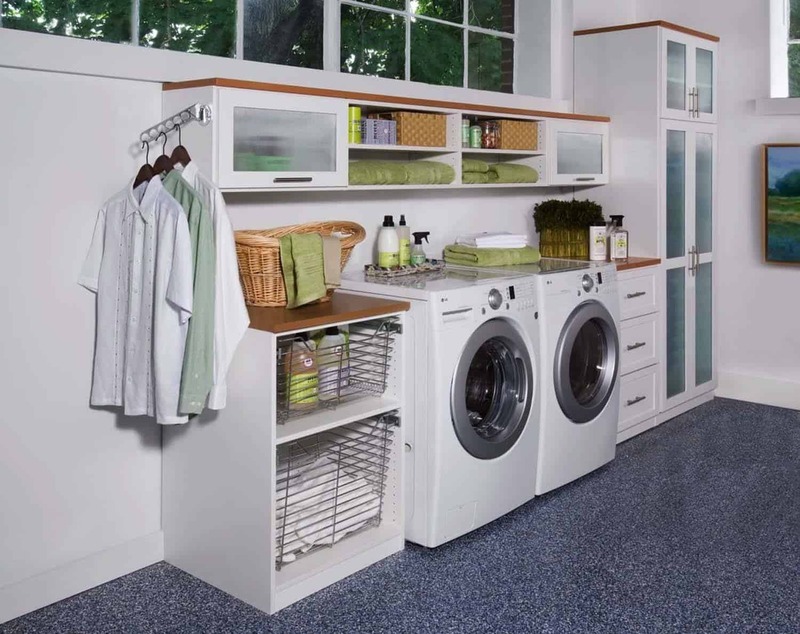 The laundry room is a very important part of your home, that’s why it’s essential to keep it well organized, tidy and functional to help keep your home running smoothly. 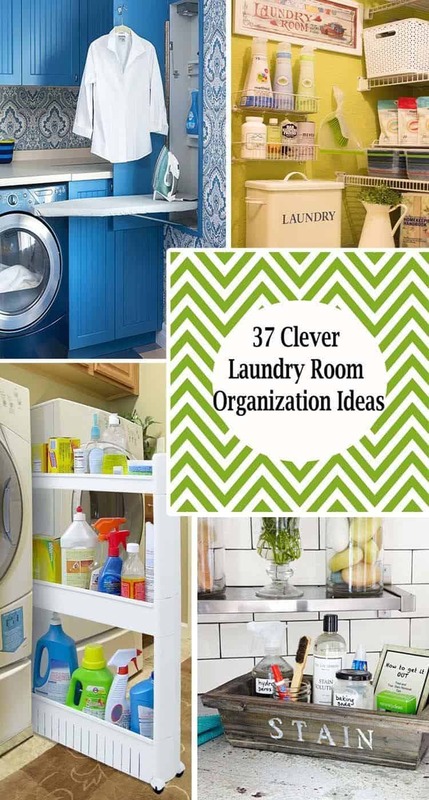 If you don’t have a laundry room, you at least have a closet area or a nook somewhere in your home, all the more reason to help get in organized and working better for you. Open shelving can be very efficient for finding things, as long as you have things such as canisters and labelled baskets so that everything has its place and is neat and tidy. Having somewhere to store your dirty clothes is essential to the laundry process, whether you have a basket stored in your bedroom, or hanging from a hook on the wall in or next to your laundry area. Ideally, built-in cabinets or open shelving to store bins would be the most organized and functional way to sort your dirty clothes. 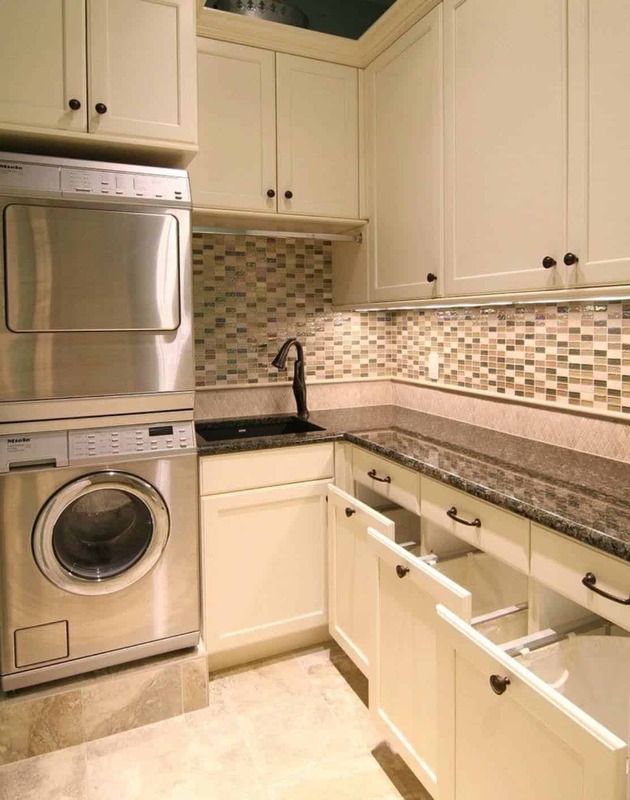 If you have limited laundry room space, we have various clever solutions for you as you continue on through this article. 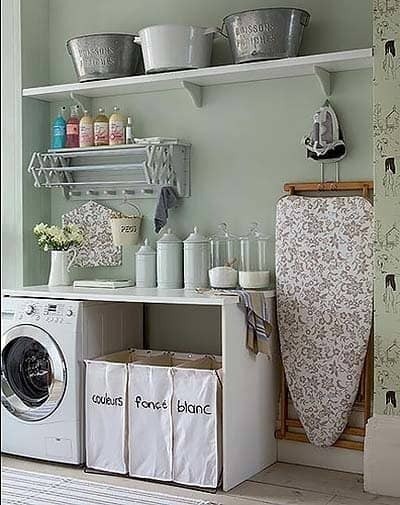 If you need a drying rack to hang your delicates, there are plenty of ideas below, as well as innovative ways to conceal or hang your ironing board. Read on for some great tips below and prepare to be inspired (sources are at the end of the article listed in order by number). 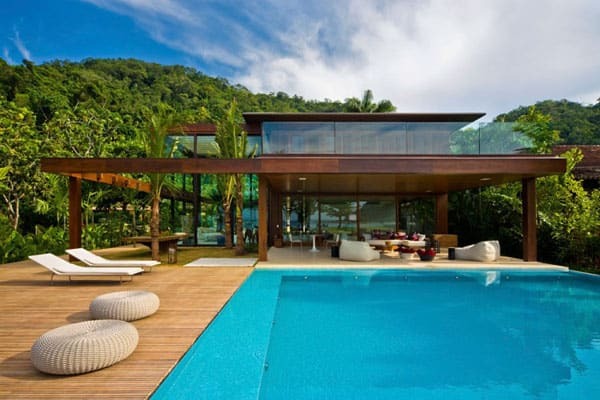 Enjoy and don’t forget to let us know which room most inspired you and why! 1. 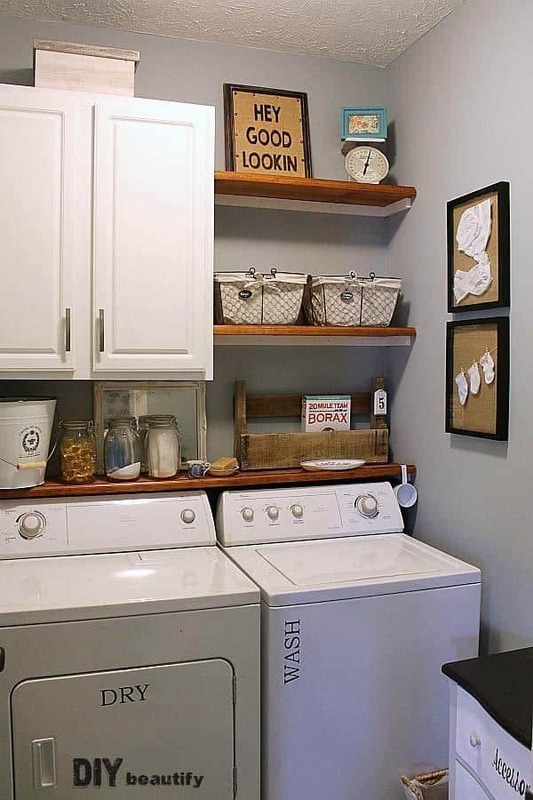 This small laundry area features open wooden shelving that has been DIY’d to host easily accessible items to make the homeowners life a lot easier! 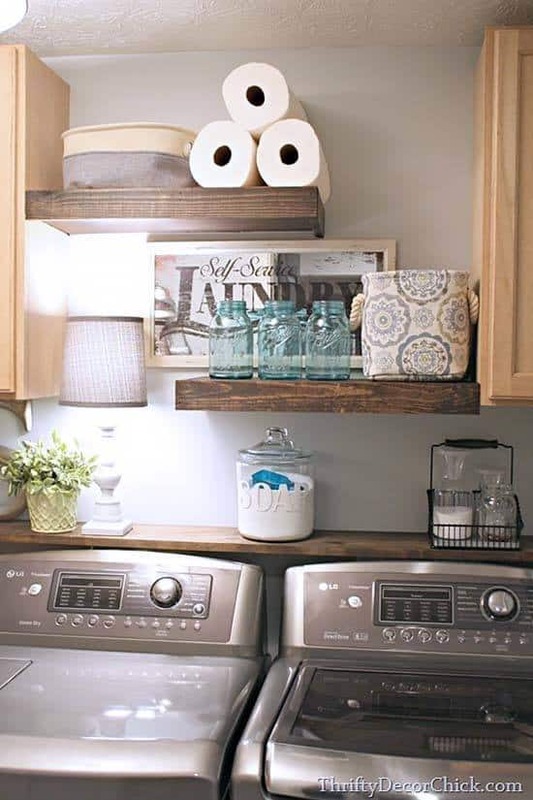 Small baskets, colorful mason jars and a lamp to illuminate the space makes laundry fun and attractive! Get the tutorial here. 2. 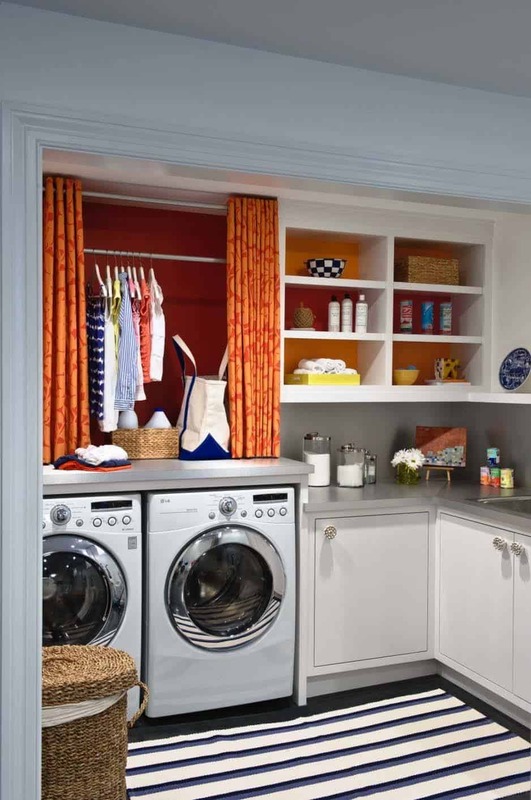 Open shelving, canisters of laundry detergent on the countertops, a laundry basket, and an area for hanging delicates (cleverly concealed by a small curtain) are a few of the great features that this small laundry room has to offer. 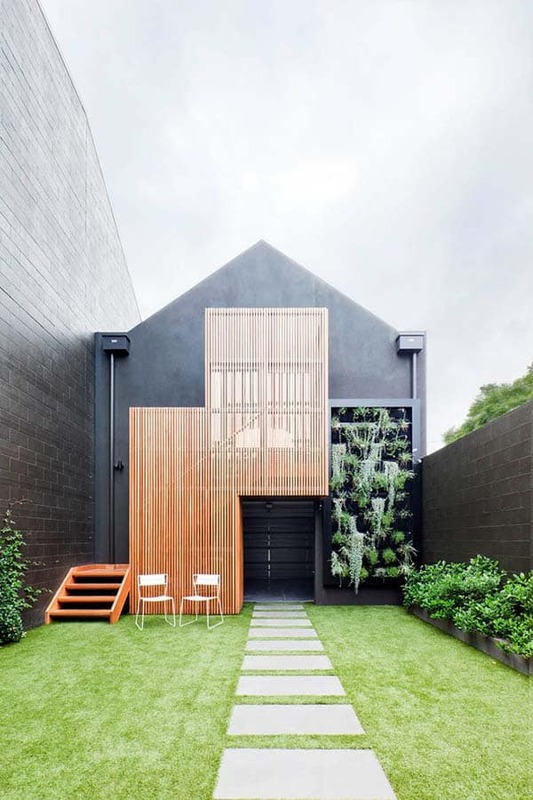 Bright orange walls helps to add a punch of color to the space. 3. Custom built-in cabinetry offers plenty of functional space for laundry and other household items. Glass-fronted cabinetry on the uppers allows visually attractive elements to be shown off, while open shelving units allows space to hold laundry baskets. 4. In this laundry area, instead of incorporating bulkier drying racks into the design, custom drying drawers were installed, making efficient use of limited space. 5. Pull-out wire drawers, deep cabinetry and shelving above the washer help keep everything neat and tidy and in its place! 6. 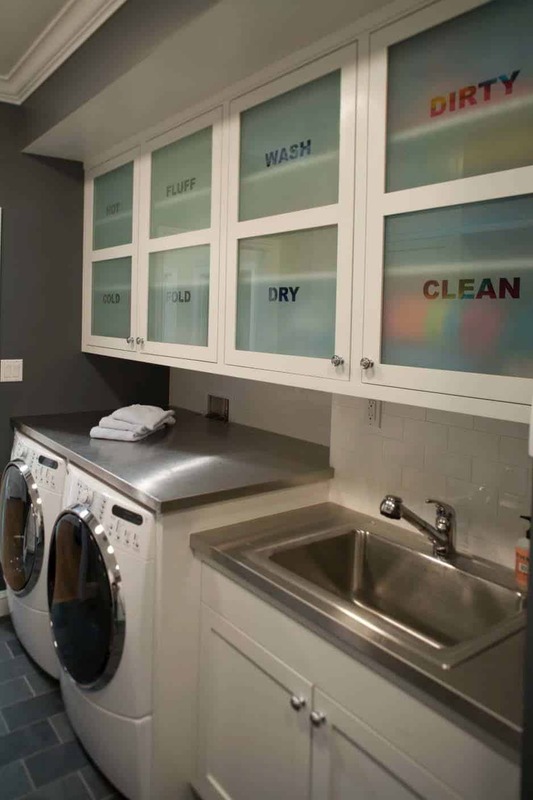 This laundry space has been organized by cabinet, where frosted glass doors with labels helps to determine where laundry necessary laundry items are stored. A stainless steel countertop above the washer and dryer allows for the perfect spot to fold your clothes as you take them out of the dryer. 7. 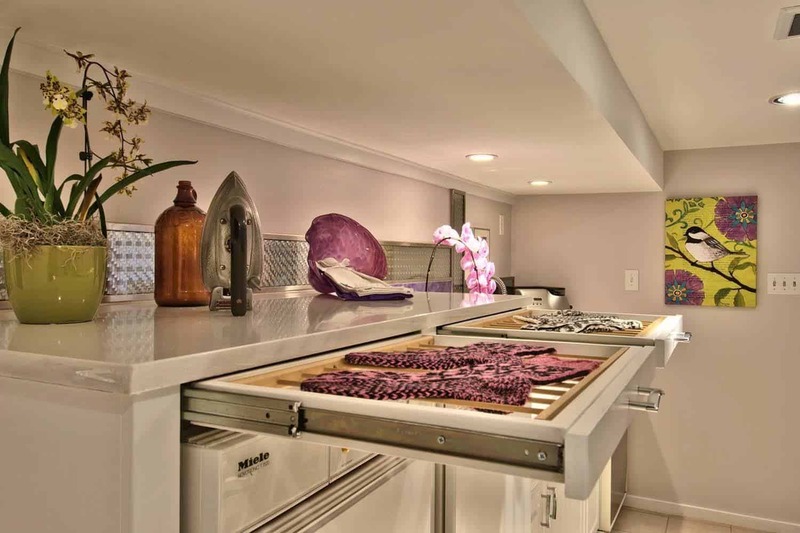 Some clever ideas here, with an fold-down ironing board by Whirlpool that is concealed by a cabinet door. There is also a drying cabinet that features a timed heating element to dry your delicates, wet bathing suits or damp towels from the swimming pool, etc. 8. Roll-out laundry baskets stored under a countertop allows for easy sorting of clothes to whatever you desire, darks, lights, towels, delicates, his, hers, etc. They can be rolled right up to the washing machine and tossed in — easy, breezy! 9. Built-in laundry hampers keeps everything tidy, organized and completely concealed. When the clothes pile up, it is time to do the laundry, which is conveniently all in one space. This homeowner selected the hamper storage to organize for whites, colors and darks, keeping everything pared down and easy on laundry day. 10. 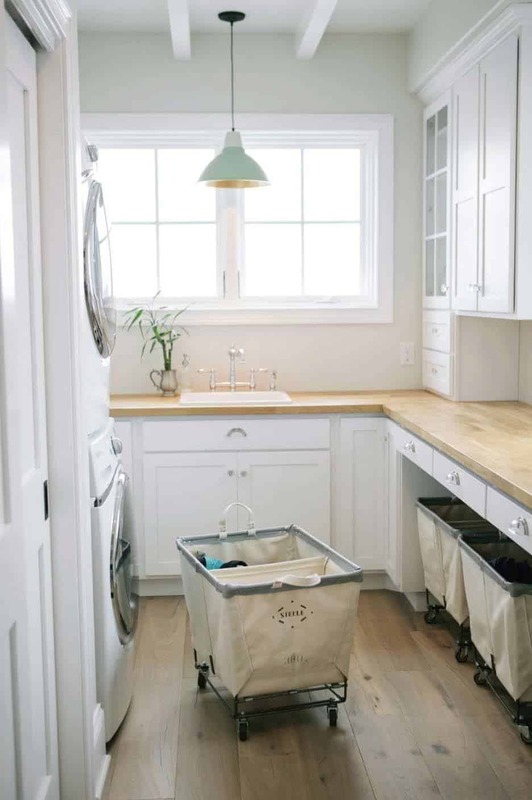 Make your laundry work perfectly for you with everything all in one space, laundry hampers organized under the countertop, a drying rack installed on the wall with space above to store bottles. Canisters on the countertop hold laundry detergents, while the counter can be used to fold laundry. The iron and ironing board are stowed away on a wall rack, while an upper shelf holds containers with extra essentials. 11. 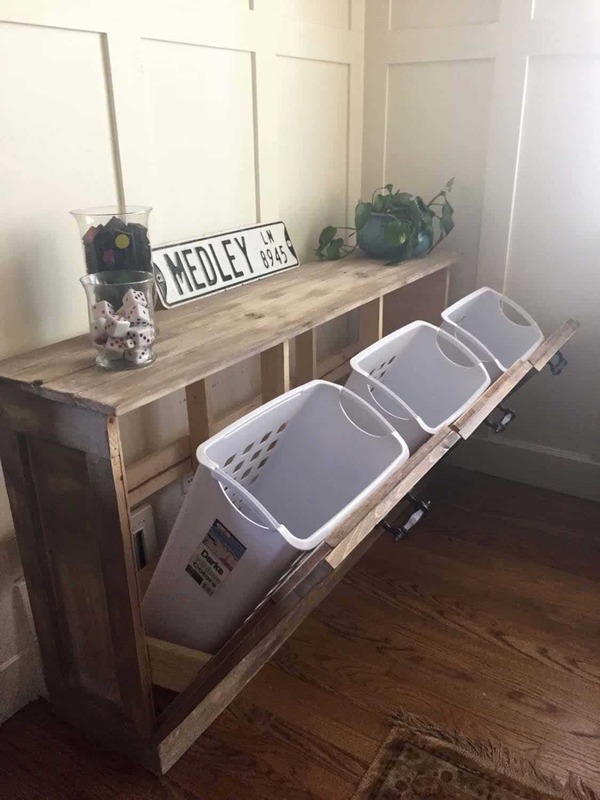 Another fantastic DIY project, or if you are not up for the challenge, you can just purchase this one on Etsy. 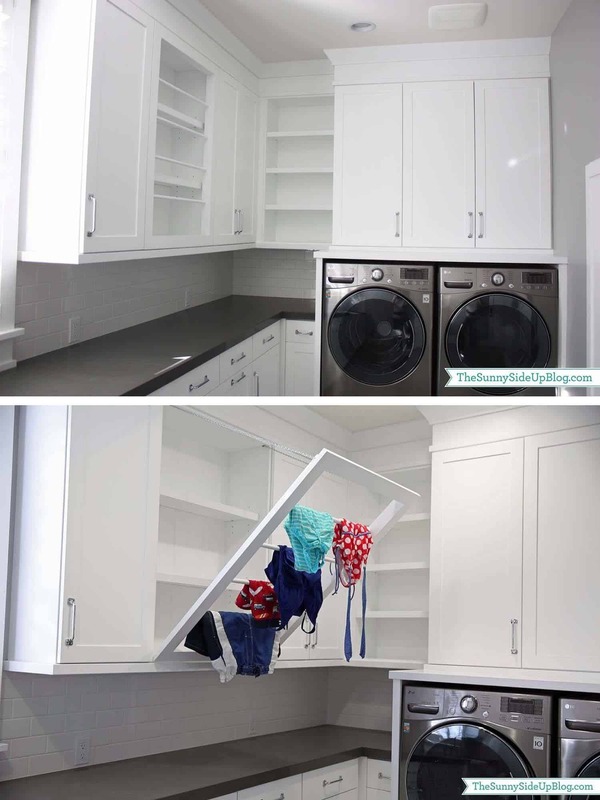 A cabinet that helps to sort out your laundry and can fit anywhere if you don’t have the space in your laundry room. Pull the handles where laundry baskets are cleverly hidden inside, helping you to sort out your darks, lights and delicates. 12. This stream-lined, slide-out storage tower fits perfectly between the washer and dryer to house all of your laundry essentials. 13. 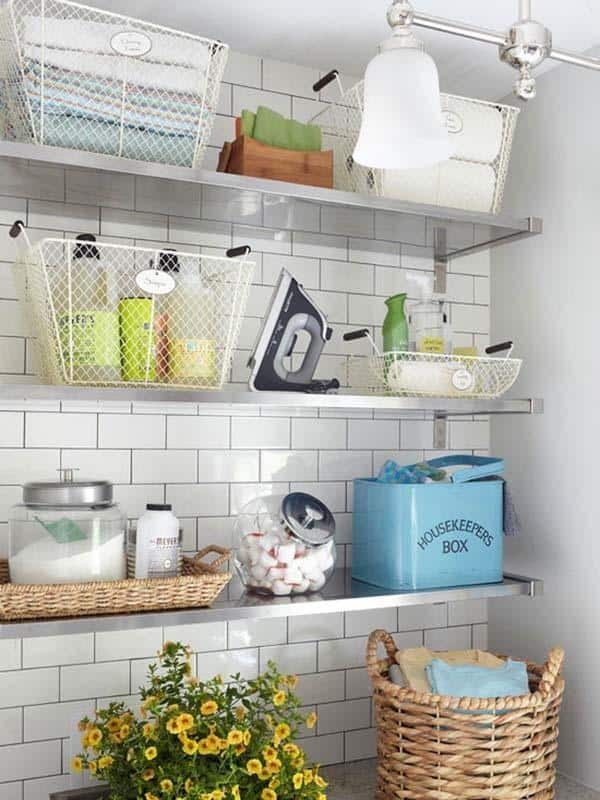 Organize your laundry room with pull out laundry baskets to help divide your lights, darks and towels or delicates! 14. 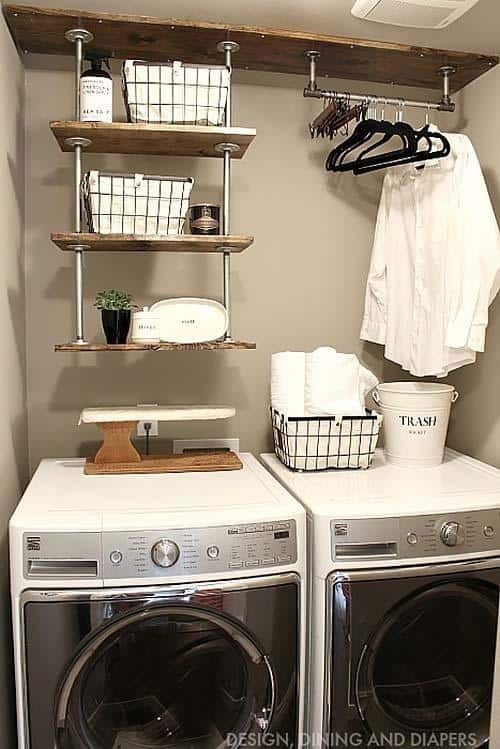 Another great feature to this laundry room is its pull down drying rack, which can be used not only for delicates, but also swimsuits and towels so that you don’t have to keep washing them after each use! 15. 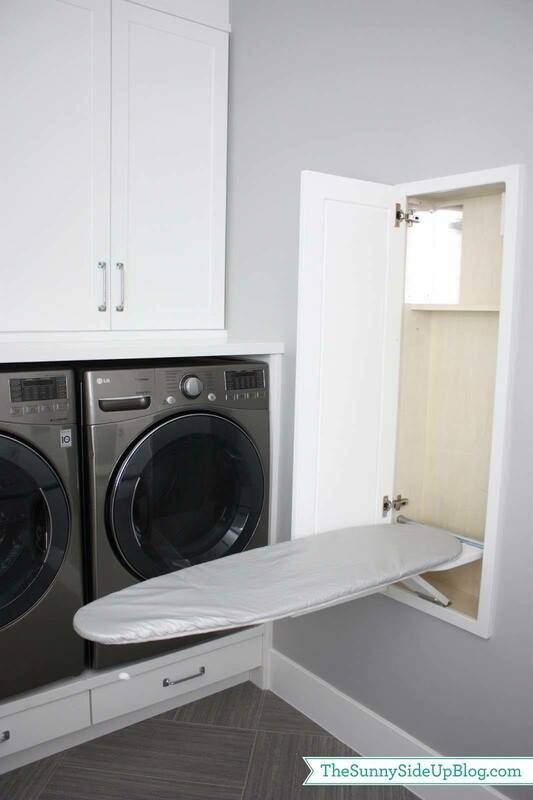 Next to the washer and dryer is a cupboard door where the homeowner had a drop down ironing board installed. A shelf above stores the iron, functional, tidy and out of the way. 16. A stain station can come to your rescue while looking adorable on your countertop. Source a cute bin to store all of your stain remedy items in one spot so that you can easily clean any accidents in a hurry. You can use this same idea to organize any of your other laundry essentials in an aesthetically pleasing container, add a label and voila! Organization at your fingertips. 17. An open shelf for easy to reach laundry essentials and built-in shelving to neatly tuck away other items. Open shelves at the end of the cabinet offers space to house baskets to sort out dirty clothing. 18. 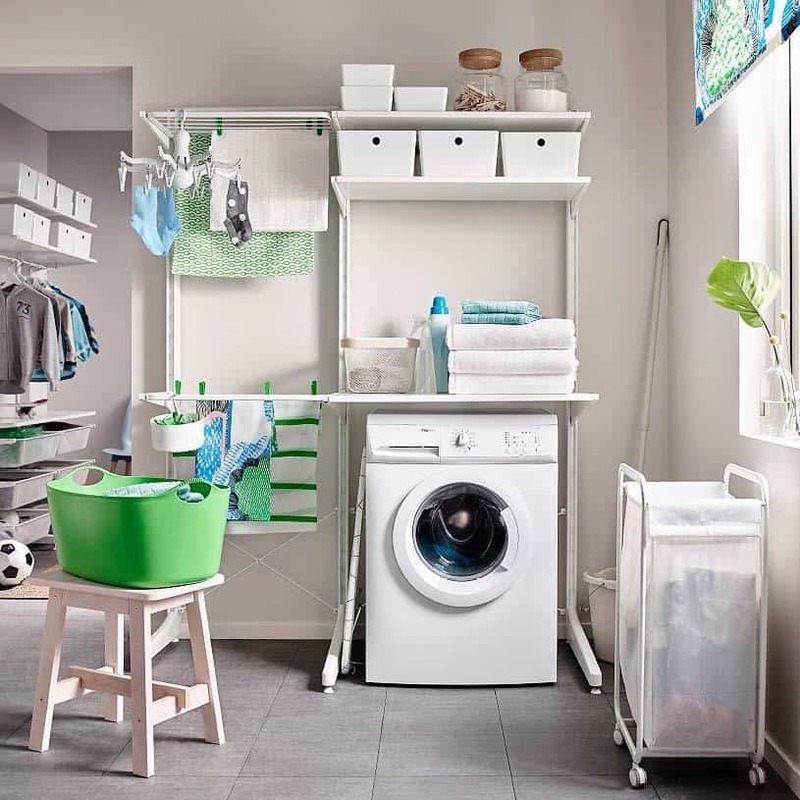 Ikea helps you to get your laundry room in order with a clever racking system to hang clothes to dry, store baskets of laundry essentials, shelving for folding laundry and a roll-away laundry basket. 19. 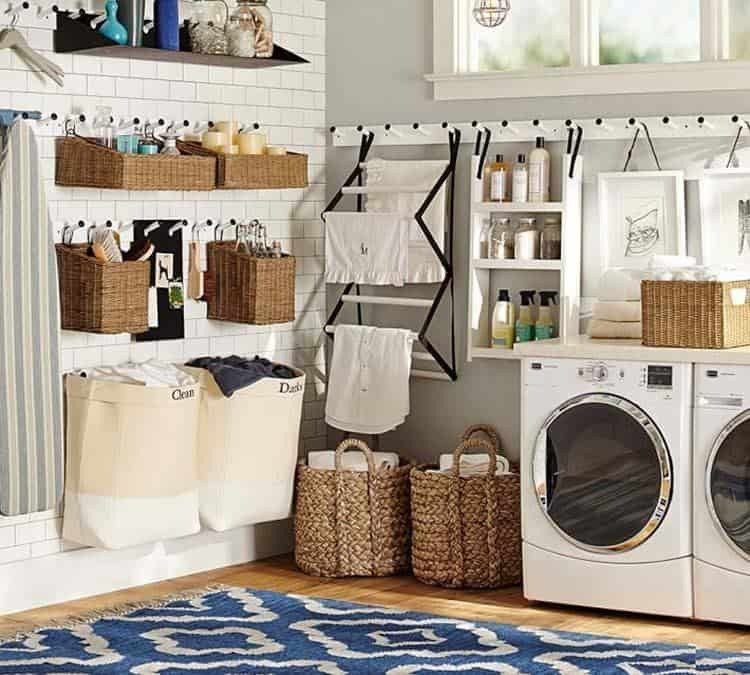 The Gabrielle Laundry Set by Pottery Barn (currently on sale for $287) offers smart and stylish solutions to your laundry room needs. There is a peg system with shelving units to move things around as needed for functionality. There is also a hanging canvas hamper for your dirty clothes that can be monogrammed to keep your family even more organized! A vertical drying rack to hang your delicates and save them from the dryer. 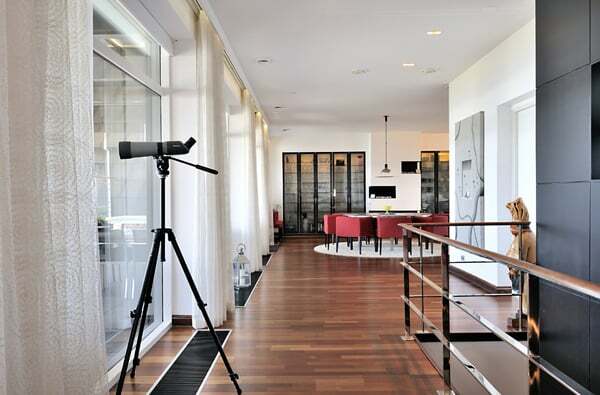 Since this is a modular system, its perfect for any space and organizational needs, love it! 20. 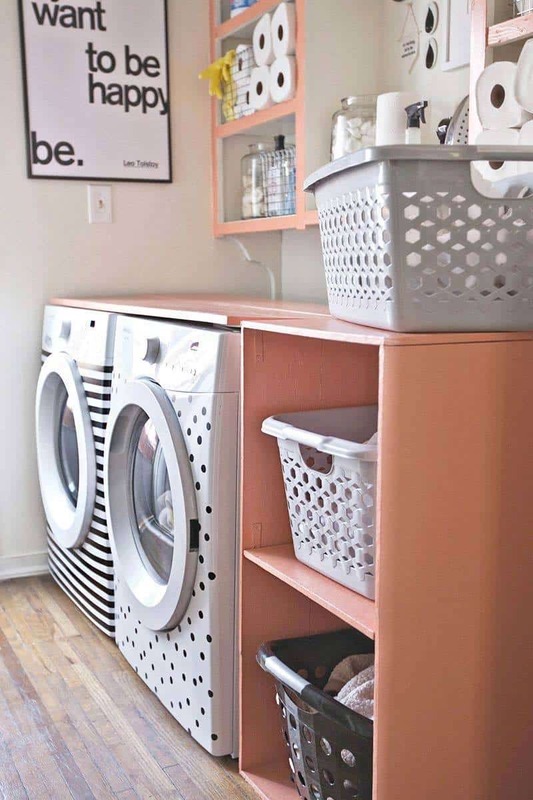 Yet another fun DIY project, this blogger used pipes for floating shelving for her small laundry space to store decorative items, and wire baskets with laundry essentials on one side. The other side offers hanging space for delicate clothing to air dry. 21. 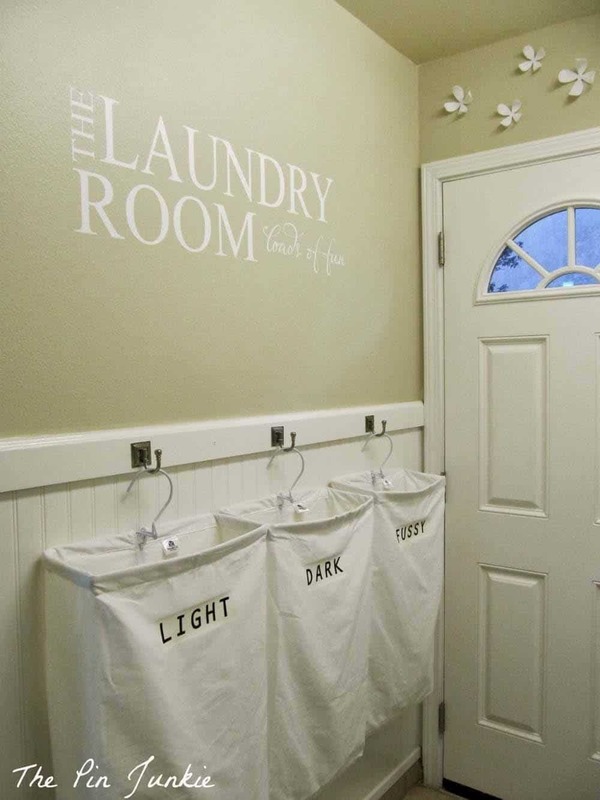 This DIY project features a stenciled wall decal to add some playfulness to the laundry area, while inexpensive wall hooks adds efficient storage of laundry bags to sort lights, darks and delicates. 22. 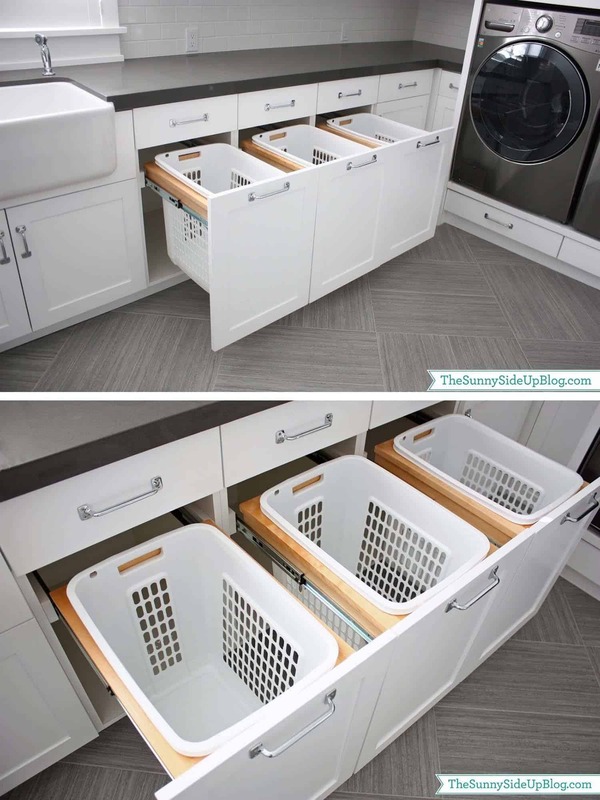 This space offers plenty of open storage for baskets to help with laundry organization. Removable cloth liners can also be washed if they get dirty to keep them fresh and clean. Attractive containers with labels can also be used to store your laundry essentials or keep towels and fresh linens stored in the laundry room. Labeling assists with organization… and you don’t need to open the lid to know what’s inside! 23. 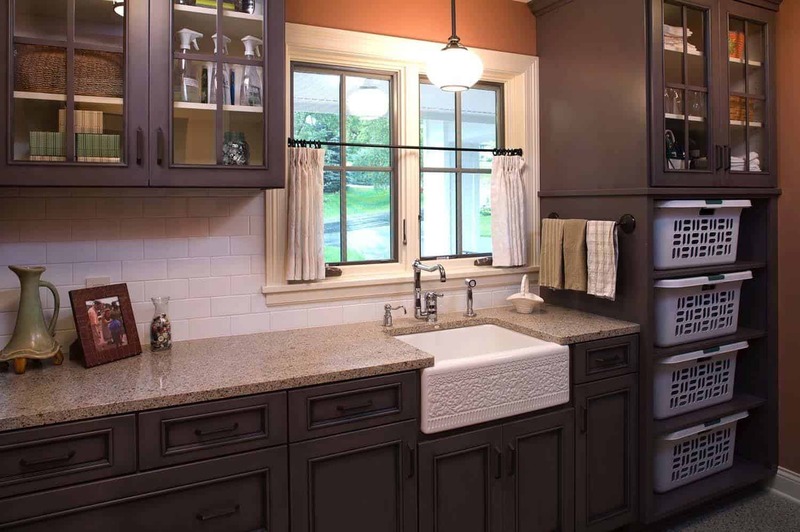 In this farmhouse remodel, closed cabinetry helps to conceal cleaning supplies. Prior to the remodel, open shelving displayed dis-organization and clutter. A few open shelves neatly display wire baskets with linen to conceal what is inside, yet labels help to reveal the contents. 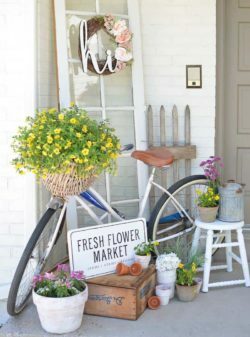 Decorative items also helps to make this space cute and fun! 24. 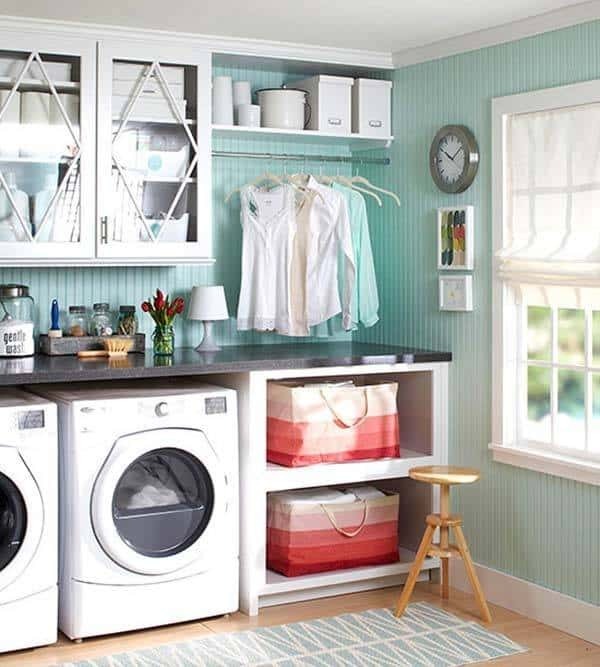 Wire shelving is incorporated into this laundry closet to create functional organization that is absolutely adorable! This blogger folds her laundry on top of the washer and dryer, adding to the necessity of shelving. Everything is in its place, with containers to store laundry detergent and stain removal powder. There is even a cute little Martha Stewart book to guide you through anything and everything when it comes to your home… very essential! 25. 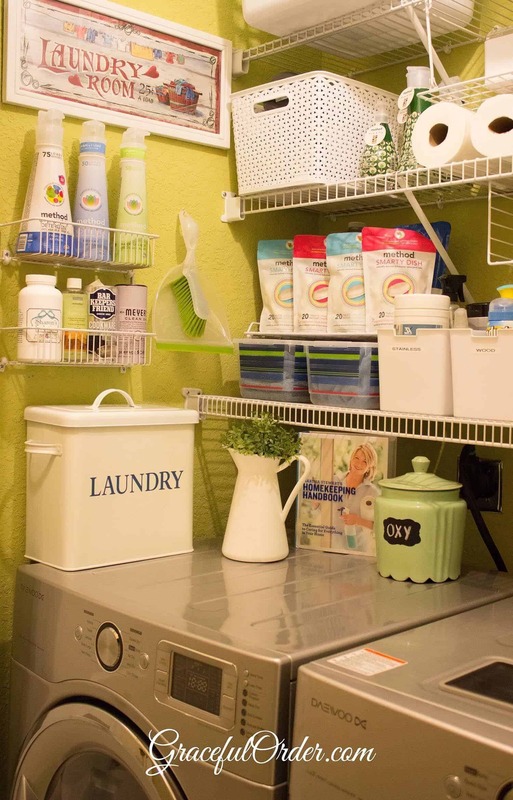 This laundry space takes care of five different laundry organizing essentials. 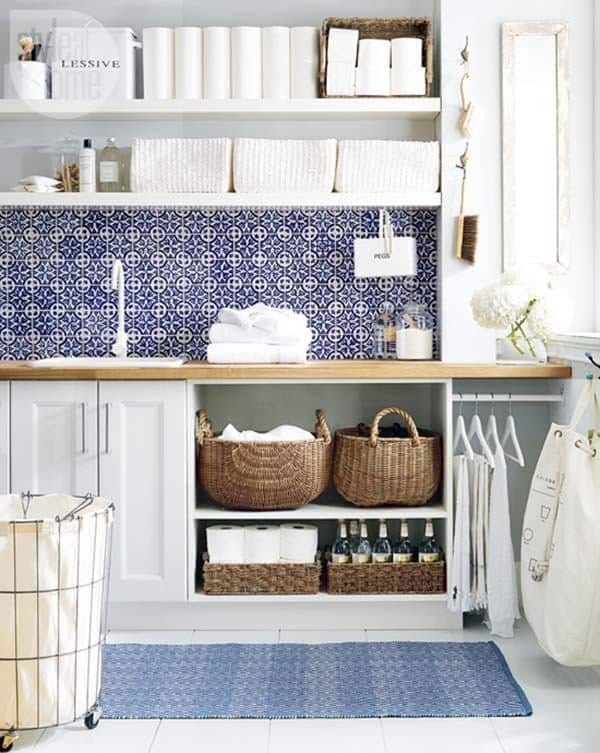 Open shelving to store baskets for your laundry essentials, an area to hang delicates, hooks in any open area to hang laundry-related items, labelled containers, and a laundry cart with wheels to roll to wherever you need it to be. 26. 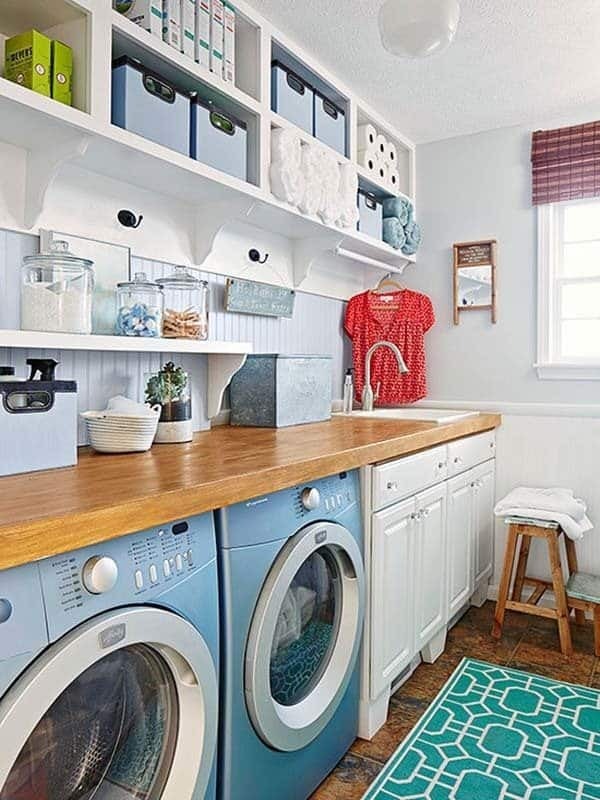 In this laundry space, deep cabinets hold colorful baskets for transporting washed and folded items, while a countertop above the washer and dryer is used for laundry sorting and folding. Glass fronted wall cabinets holds detergents and supplies for easy accessibility. A wall mounted clothes rails allows for delicates to air dry and above this is an open shelf for additional storage. 27. 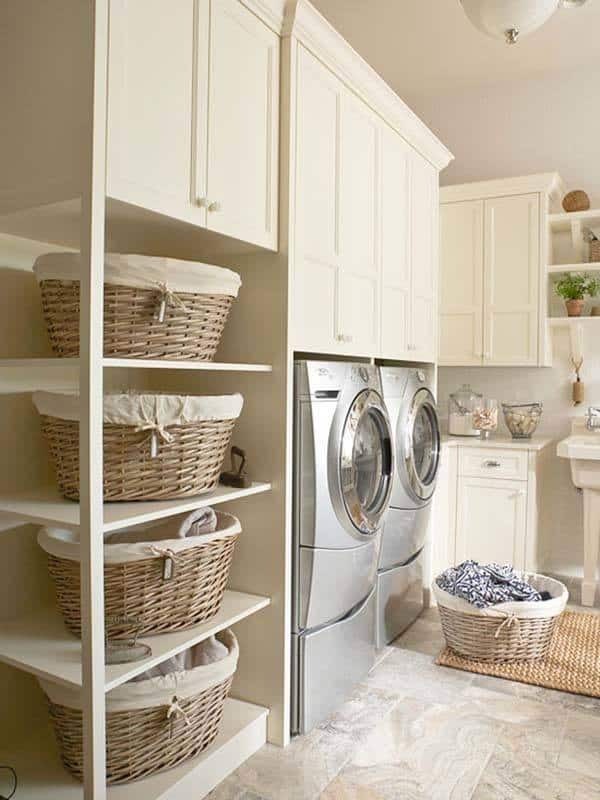 Wire shelving above a closet laundry room allows for laundry essentials and space to store laundry baskets. 28. 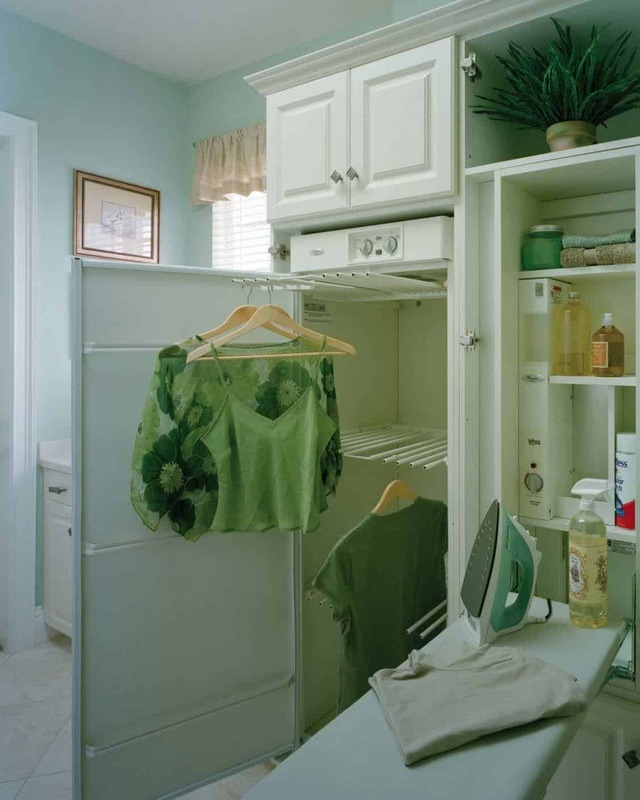 In this small, budget-minded laundry area, the designer opted to add a fresh coat to the space, an inexpensive way to make the area feel bright and airy. Wire shelves were added for plenty of storage, wood was added on top to create sturdiness so items would not slip between the cracks. Baskets and bins were added to organize all laundry items. Labels were also added to help with efficiency. Hooks were added to the wall for those miscellaneous items such as ironing board, iron and mop. 29. 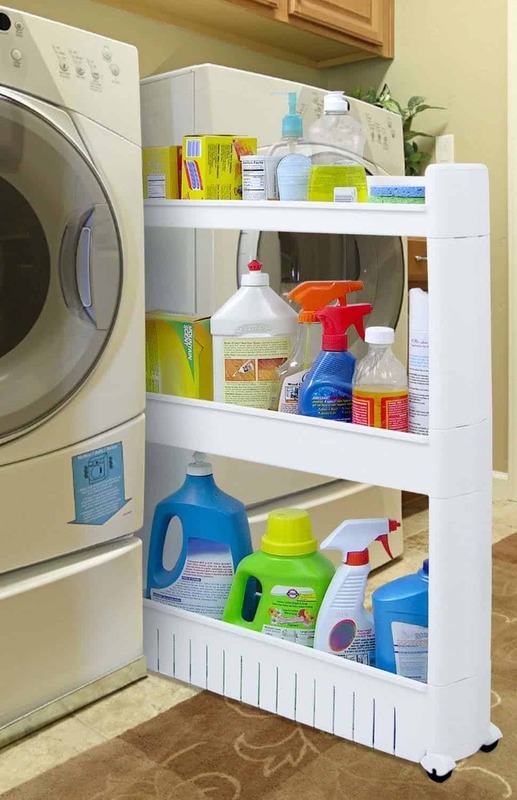 Open metal shelving plays host to an assortment of laundry items and cleaning supplies. There is a stylish mix of containers from new to vintage that makes spotting essentials a synch during each stage of the laundry process. 30. 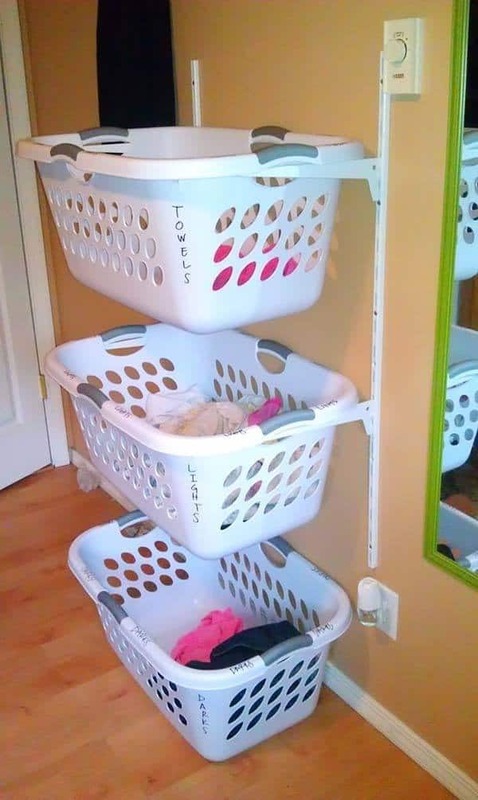 A wall bracket helps to organize laundry baskets in homes with limited space that need essential organization. 31. 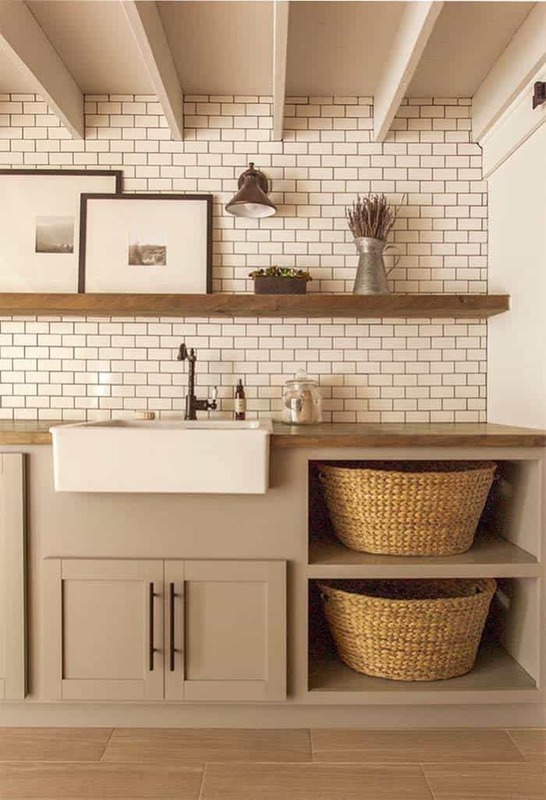 Extended open shelving in this laundry space makes sorting and storing laundry necessities simple and fun. Colorful baskets store miscellaneous items out of the way, while clear canisters allows you to visually see what is inside for the laundry process. Hooks can be used to hang items, while a rod helps with hanging delicate. 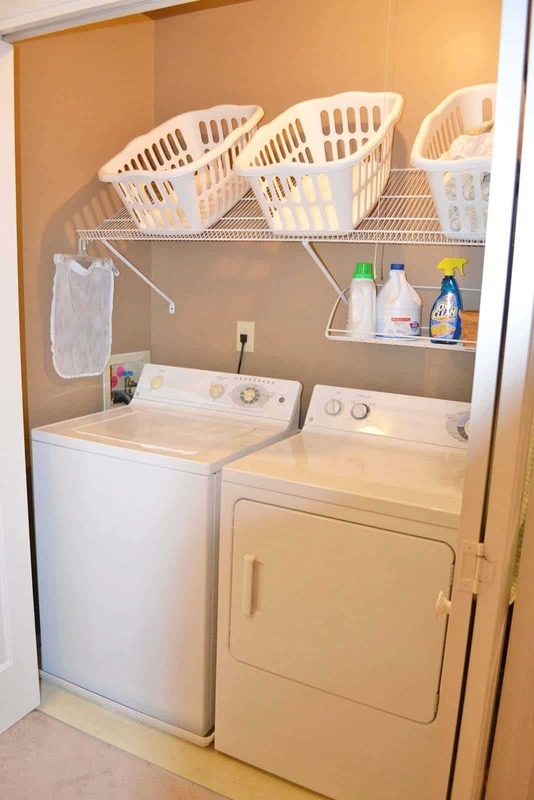 Counter space above the washer and dryer allows the perfect space for laundry folding. Closed cabinets help to conceal household items that you wish to have neatly tucked away. 32. 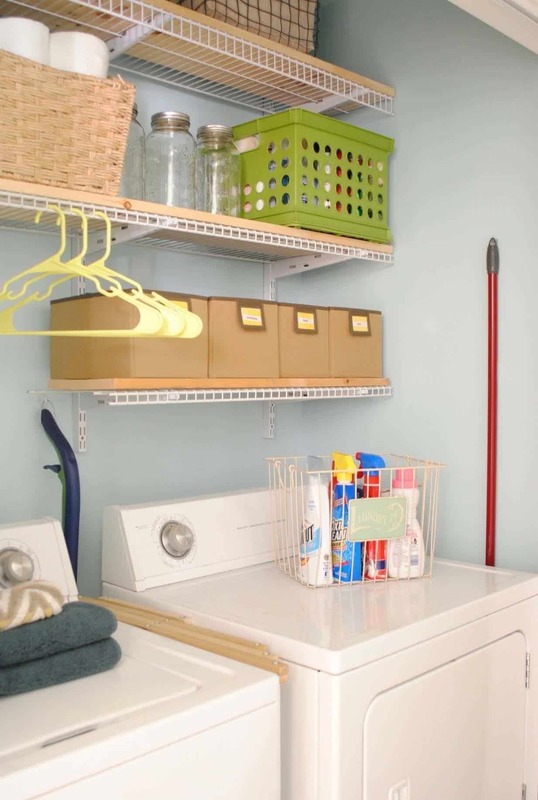 The back of the door to a small laundry room gets organized with a door rack from Home Depot. Before installing the wire rack, chalkboard paint was used to create visual interest and for labeling. 33. 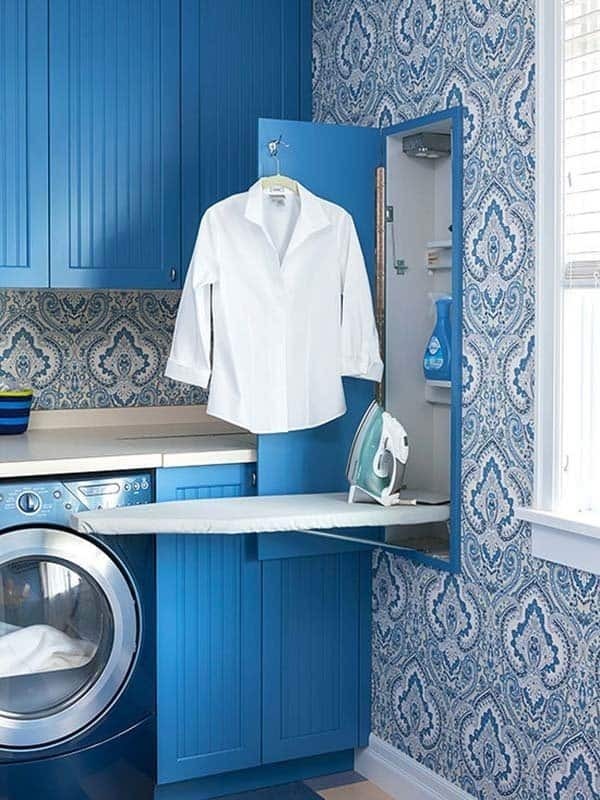 Aesthetically pleasing and functional, this blue and white laundry room incorporates a drop-down ironing board behind a built-in paneled door in the wall. This efficient space offers a shelf for your spray bottle to help get out the wrinkles, an electrical outlet and hooks in case you need to hang something… awesome! 34. Inspired by a drying rack from Ballard Designs, this blogger created her own drying rack from a diagram she drafted on a napkin! 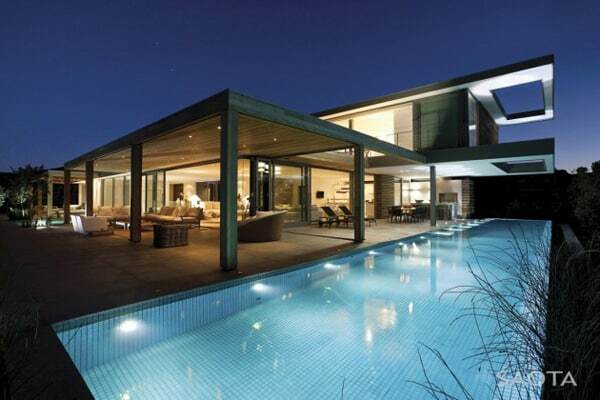 The finished result came out pretty terrific don’t you think? The tutorial on this DIY project can be found here. 35. 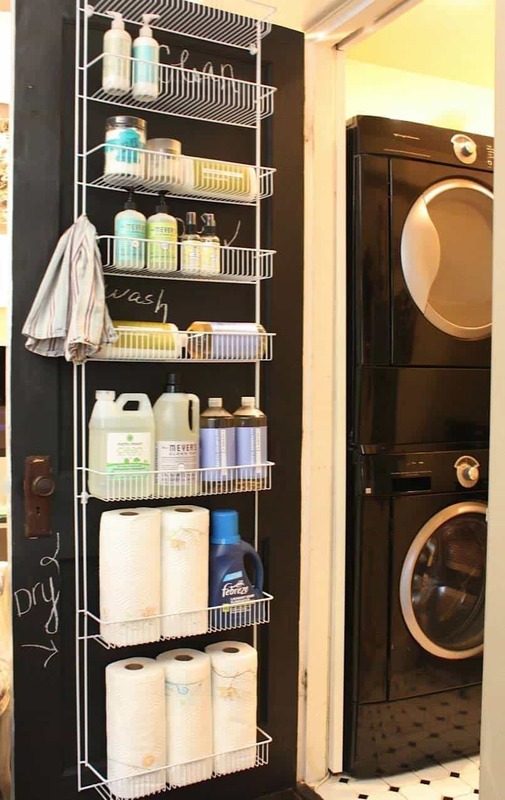 A DIY laundry room shelf for storing laundry baskets adds plenty of organization and functionality, find the tutorial how-to here. 36. 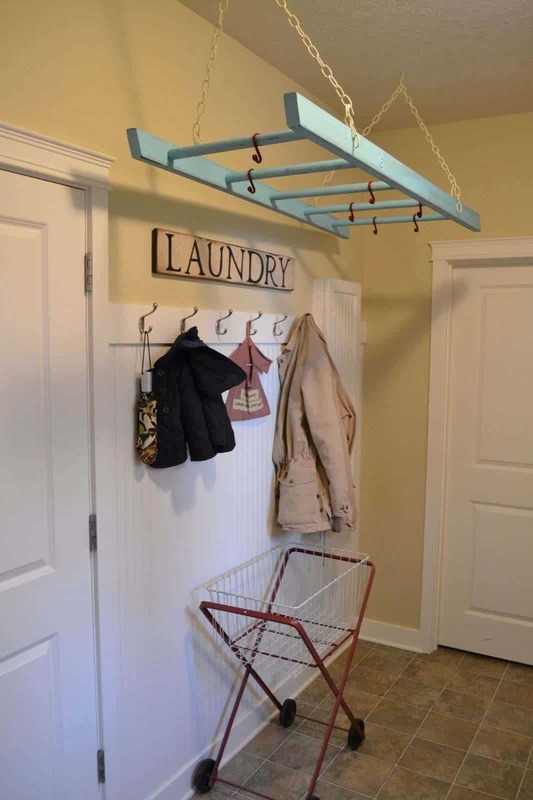 A small laundry room led to the clever inception of suspending a reclaimed ladder from the ceiling for drying delicates, the tutorial how-to can be scouted out here. 37. A closed cabinet is complimented by open shelving on either side to easily access organized items on the shelves and tuck away miscellaneous items behind closed doors. 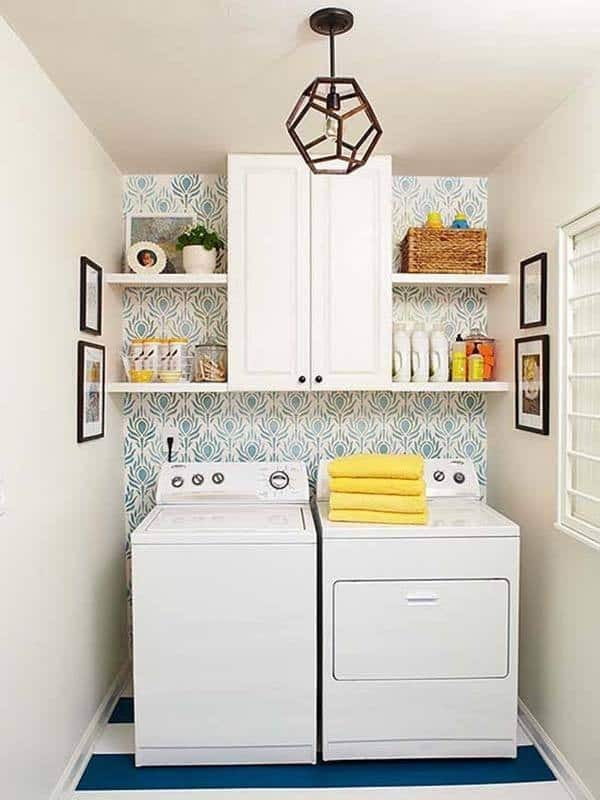 Patterned wallpaper benefits the open shelving, creating a nice visual aesthetic to a small laundry room. ** If you are looking for more inspiring laundry room ideas, have a look at these past feature articles here on 1 Kindesign: 51 Wonderfully clever laundry room design ideas, 60 Amazingly inspiring small laundry room design ideas, or if you are looking for some amazing mudroom design inspiration, have a look through 55 Absolutely fabulous mudroom entry design ideas.